The first version of the Primary Resources site went online in November 1998. The site was initially produced using free software from a PC magazine coverdisk and contained a small collection of teaching resources by Gareth Pitchford, the site's creator. At first the site was only designed as a way of sharing the worksheets Gareth had created but then other teachers started sending in their own material as thanks for the resources they had used. The site was expanded to include these contributions and it's then that the whole idea of sharing material through Primary Resources started. At the end of 1998 the National Grid for Learning wasn't as organised as it is now and Primary Resources (along with other sites like Mark Warner's Teaching Ideas and the Teacher's Library) seemed to fill a gap. 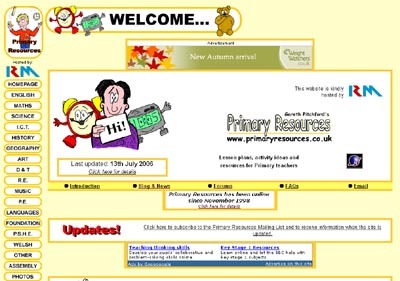 The site was originally hosted on several chunks of free webspace (with different resources on each one) but in 1999 the www.primaryresources.co.uk domain was purchased and the whole site was moved there. New software gave the site a brand new look and the site was easier to use and navigate. Large hosting costs forced the Primary Resources site to move hosting companies again and in 2001 it also got a another new look that's similar to the one in use today. In February 2002 the site was forced to close temporarily due to the strain it was putting on the shared server it was hosted on. Thanks to the support of RM the site was brought back online by the end of April. RM very kindly host the site for free. Without them we would either be forced to close the site or start charging for access to cover the costs of keeping it online. In April 2002 the extremely popular Harry Potter teaching resources (that had been on the site since 1999 and had been contained in their own mini-site since 2001) got their own web site. This site closed later the same year after discussions with J.K. Rowling who did not wish her books to be used in a didactic manner. Primary Extra (http://www.primaryextra.co.uk) was also launched in 2002 (while the main Primary Resources site was down) and this contained many of the original resources that were included in the Primary Resources site back in 1998 (such as the cartoons). In 2003 the Primary Extra material was brought back under the Primary Resources banner to reduce the number of sites that needed to be maintained. In September 2005 a new phase of Primary Resources' life started with more time spent working on the site and weekly updates. The site had another facelift and a major restructure with resources reorganised so that they were easier to find. A new Primary Resources Blog was set up to share site news and links and a brand new UK education news mini-site was created (this was closed in January 2006). At the end of October 2005 Primary Resources was joined once again by it's sister site Primary Extra which was now a home for specially created commercial resources. In March 2006 the photograph section was added to provide a home for pictures of displays and other useful educational images. Primary Resources got another face lift in September 2006 with slightly redesigned menu pages and new forum software. During September 2007 a new section for primary teaching links was created. The mini-site, Primary Interactive, was introduced as an easy way for students to access some of the old online activities from the main Primary Resources website. Over nineteen years after it first launched, Primary Resources continues to be a free forum for sharing teaching ideas and resources. The site is used by thousands of teachers worldwide and it's thanks to the contributions by hundreds of those teachers that the main site now features well over 3GB of free-to-download material.